Kabuki actor Tamasaburo Bando interprets Bach. 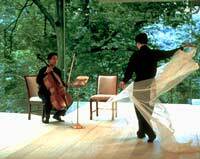 In STRUGGLE FOR HOPE Yo-Yo Ma and Kabuki actor Tamasaburo Bando combine talents to create an emotionally charged dance performance to J.S. Bach's Suite No. 5 for Unaccompanied Cello that draws its inspiration from two very distinct worlds. As eastern mysticism meets western rigor, the two rehearse and discuss the ultimate goal: a performance that enhances both traditions and transcends the cultural boundaries that naturally exist between them. Six Gestures with Torvill and Dean - Ice dancers Torvill and Dean interpret Bach's Suite No. 6. "The collaborative process depicted on camera is as fascinating as the final choreographed realizations of the music, as both musician and interpreter strive to unite their visions of elevating Bach's music to higher artistic planes." "Filmed in gorgeously rich colors."